Premium direct-to-factory crossbar carrier delievers maximum stability and protection through its oversized aluminum tray and precision skewer. 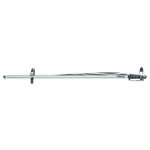 Easy-to-use loackable stainless stteel skewer with oversized lever makes for secure loading and unloading. 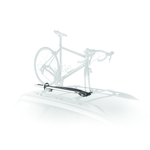 Aerodynamic durable aluminum construction provides stable mounting platform. Easy-to-use lockable stainless steel skewer with over-sized lever makes for secure loading and unloading. Adjustable wheel strap with integrated wheel stabilizer for secure bike transport. 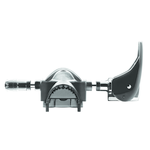 Versatile design compatible with standard 9mm axles and most disc brakes. Carries bikes with wheelbases up to 48" and tire widths up to 2.3".